If you’ve got defending problems, experienced youth coach Mike Beale may have the answer. Coaching defending to young players is difficult – kids are brought up to think that scoring is everything. That’s why Mike compiled this manual containing a series of fun drills that focus entirely on defending. It’s become a best seller. Perfect Defending contains a series of fun drills focusing entirely on defending, plus techniques to coach the block tackle and slide tackle. This manual is the ultimate resource for coaches who want to enhance defensive skills and techniques. Marking, Tackling, Blocking, Jockeying, Positioning, Forcing the direction of play, Clearances, Recovery runs. Individual Defending gives players a chance to practice the core defending skills. This forms an obvious starting point for young or inexperienced players but is also extremely valuable for older players who tend to lose focus on these vital skills over time. Defending in Twos, Defending in Small Groups and Team Defending provide different challenges as your players learn to take the core skills into more competitive and match-like scenarios. Fun Defending Games gives a few ideas for ways to challenge your players with a light-hearted edge. These games are perfect to introduce in your training session when your players show signs of fatigue or a loss of concentration. Building from individual defending to team defending in this way, players are able to constantly refine their understanding of the roles and responsibilities in defensive positions. The manual also includes a step-by-step guide to executing two of the defender’s most valuable moves, the block tackle and the slide tackle to print and distribute to your players. Mike designed Perfect Defending with you, the coach, in mind. Introduction – An explanation of the drill and the skills and techniques it focuses on. The set up – Shows everything you’ll need to run the drill from the size of the area to the number of balls and cones. The steps – All of the movements and components of the drill, explained in plain English. Large text makes everything easy to read, even in driving rain and wind. What to call out – Three handy phrases per drill, never be short of something to say to encourage and educate your players. Key – Makes sure you can differentiate between runs, dribbles and passes in the illustrations. Category – Five groups: Individual defending, defending in twos, defending in groups, team defending, and fun defending games. Illustrations – One for each of the steps means that you can easily visualize the sequence of movements that are involved in each drill. Captions – Underline what’s happening in each illustration. An A4 PDF document to store on your computer. You can help the environment by saving trees and using less chemical-based ink by only printing out the games you need for the day. An A4 spiral bound printed report with waterproof covers for your bookshelf, desk or kitbag. Spiral bound means you can use it without having to hold the page open as with most bound books. You can copy or print as many copies as you like for distribution to your players and colleagues in your club. Or, get both formats – get the best of both and SAVE money! Combine the benefits of immediate PDF delivery and the ease of printing individual drills with the practicality and durability of the color printed version. I love how the drills move from small games, 1v1, 2v2 up to full squad drills. The diagrams are easy to follow and understand as you have small notes to explain each step as well. All in all a must for all coaches along with Soccer Attack! The kids look forward to training as the sessions are fun interesting and above all teaching them the skills to play better football. This manual is superbly designed and illustrated with easy to understand instructions and diagrams to match. I am sure that it will help to create fun and educational sessions that will feed your players’ enthusiasm for the game. An excellent and comprehensive manual with lots of good ideas when you want to focus on defense in your session. Defending in twos and threes has been a big part of the progression of my players from U-7 to U-11, and this book has been key to coaching those ideas. Perfect Defending was the first Soccer Coach Weekly Publication I bought. I came to the SCW site specifically looking for help in coaching defensive tactics, so this is where I started. Without question, this book is worth every cent. One thing I’d noticed in 5+ years of coaching is that coaches at the younger age groups rarely teach proper defending skills early on. I coach a team of very talented young players at the U12 level and they face some pretty strong opposition. Without a really strong defence, we wouldn’t stand a chance at winning games, let alone be in the game. Defending is every bit as important as any other aspect in the game. And now that I’ve been using this book for 6 months, our defensive lapses are very rare and we’re extremely difficult to score on. So, Perfect Defending has been invaluable for me. There are drills and tactics that cover every aspect of the defensive game, from defending 1v1 right up to defending as a team. The drills are well illustrated, well explained, and easy to run. And if you want to customize a drill or exercise to fit a problem you’re trying to solve, that’s easy too. I think the best part is that if you use this book in conjunction with any of the other SCW publications to build a system that suits your team’s strengths, it’s as good as having a team of coaching staff on your side. Perfect Defending has been a real help in planning through quality sessions that incorporate defending techniques as well as the philosophy of it. It’s easy to understand diagrams and explanations make it much easier to communicate the important points in ways the players can understand. Having this as a tool help me keep training dynamic and on point! Thanks Coach Beale and Soccer Coach Weekly! This is one of the best manuals I have found as far as teaching the elements of good defending. It has a very simplified way of presenting some of the elements that the players normally have difficultiies applying during matches. I am very pleased with the results as I have minimized the complexity issues in dealing with good defending. This book is made of many situational and progression plans which are easy to follow and understand, both for the coach and players. My U11 team was getting hammered all fall. I started these drills in the spring and we improvement in defense was immense. I haven’t even gone through the whole book, yet. “Michael Beale has created a superb resource. The manual is full of superb illustrations which make defending simple to understand and progress sessions to match the ability of the players. “I bought Perfect Defending to add to the “64 Small-Sided Soccer Games” and “Soccer Attack!” books I’ve already bought from your company and extensively used. The players enjoy the exercises and have improved greatly. The young players learn from the games themselves with little input from me whilst I can go into much more depth with the older players with the same exercise. “I’ve found the Perfect Defending manual loaded with great games that are not only fun, but incredibly relevant from the U10 to the U19 players. The diagrams are easy to follow and the coaching points are simple. These games provide the impetus to create very dynamic sessions that use the game as the teacher and provide the game situations that the players encounter that they will need to solve come Saturday or Sunday. 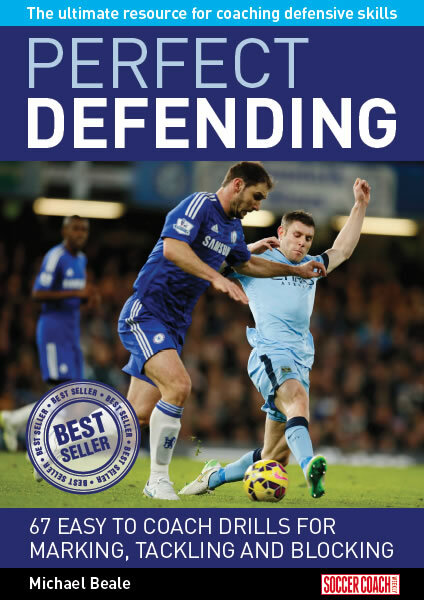 “Since purchasing Perfect Defending it has helped me enormously as a coach and given me a greater understanding of the technical aspects of the discipline. The drills are well laid out and easy to understand and implement. Our defense now works a lot better as a unit. “I coach an under 11s team and they really love practicing the exercises that Perfect Defending suggests. Before getting the book the defensive part of our game was quite weak.